Acknowledgement: Sincere gratitude to Professor Basarab Nicolescu (President of International Center for Transdisciplinary Research, CIRET) for vetting a draft of this paper, and for being such a gracious and patient TD-mentor. This paper is about transdisciplinary (TD) methodology, especially TD ontology. Methodology is a branch of knowledge that deals with the general principles or axioms of the generation of new knowledge: epistemology, ontology, logic and axiology (Ponterotto, 2005). The methodology determines the research questions, theories and conceptual frameworks, methods (research design, data collection, analysis) and reporting of results. The three dominant research methodologies are empirical, interpretive and critical (McGregor & Murnane, 2010). 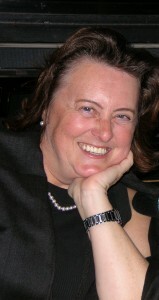 Basarab Nicolescu1 is the primary advocate of a fourth methodology, transdisciplinarity. As with any methodology, the TD methodology comprises three, some say, four axioms: multiple Levels of Reality (ontology), knowledge as complex and emergent (epistemology), the Logic of the Included Middle (Nicolescu, 2010a, 2011), and integral value constellations (axiology). For clarification, although McGregor (2009, 2011a) and Cicovacki (2009) added the fourth pillar, axiology, Nicolescu (2010b) does not feel this axiom is necessary. This paper focuses on TD ontology because, as Nicolescu (2010b) noted, it is the core of the TD methodology, and the most contested axiom. For many centuries, what counts as reality as been determined by classical physics. Granted, “physics has travelled far from the simple picture of macro-physical reality provided by classical physics a century ago” (Mayne, 1992, p.1). Nonetheless, people’s habits of mind are still governed by classical logic, making it difficult to transition to other notions of science, including quantum physics (Nicolescu, 2010a). While multi- and interdisciplinarity stem from classical physics and sciences, transdisciplinarity stems from quantum physics and quantum cosmology as well as chaos theory, living systems theory, consciousness sciences and other human sciences (Nicolescu, 2010a, 2011). This collection of sciences rejects the basic laws and tenets of classical physics, as does transdisciplinarity. The laws governing the behaviour of quantum entities differ from those governing entities in the classical macro-physical world (Cole, 2006), see Table 1. 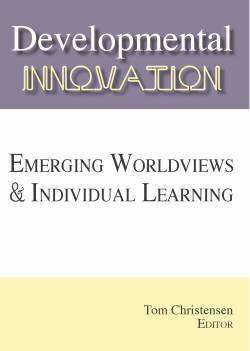 Transdisciplinarity asks people to bring an entire new paradigm to bear on solving the complex problems of the world (van Breda, 2008). “As is often the case when a different conceptual framework is adopted, many basic issues regarding the nature of the objects studied (ontology), the nature of the knowledge involved (epistemology), and the nature of the methods used (logic and likely axiology) have to be reevaluated” (Marquis, 2010, p. 17). Such is the case with a transdisciplinarity methodology. Engle (2008) posited that three methodological questions are interrelated and asserted that they need to be asked in this particular order: What is the nature of being (ontology), what is truth (epistemology) and what are our fundamental values (axiology)? He stated that ontology is most important because if people know the nature of existence, then they can determine when something is true, false, unknown or unknowable (using appropriate logic), which in turn helps them determine the nature of fundamental values and of moral choices. Nicolescu (2010b) believes that resistance to how TD conceives Reality (ontology) creates “an unconscious barrier to a true dialogue” about transdisciplinary methodology (p.23). This paper assumes that if people can gain deeper understandings of how TD conceptualizes ontology, they are more likely to be receptive to the entire TD methodology (including the axioms of logic, knowledge and values). 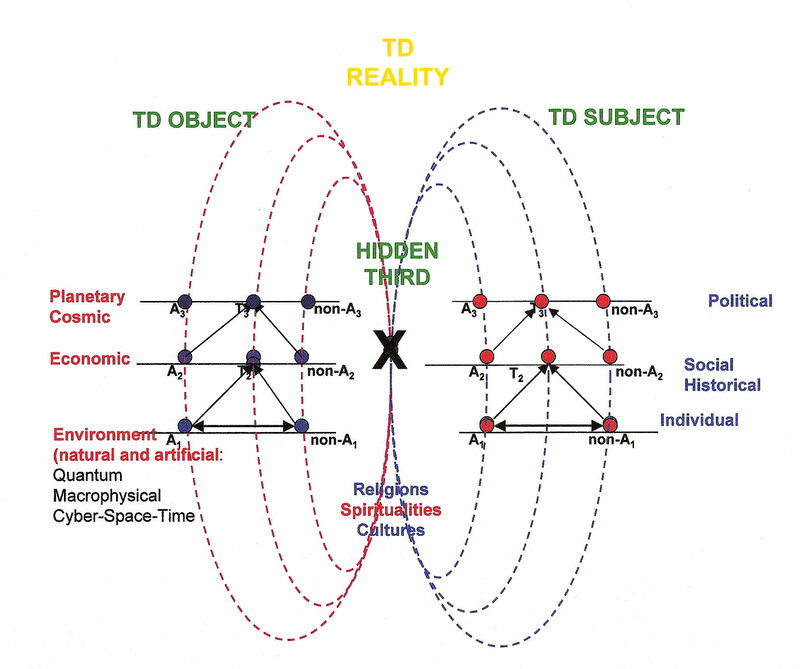 This paper’s focus on TD ontology (multiple Levels of Reality and the Hidden Third) is an attempt to move people beyond the classical physics’ interpretation of the concept of Reality. Following clarification of the differences between real and reality and that the quantum vacuum is not empty, the paper describes multiple Levels of Reality and the Hidden Third, and then demystifies (removes the mystery surrounding) three central concepts of TD ontology: discontinuity, resistance, and incompleteness. The paper concludes with a discussion of the movement of Reality and why transdisciplinary ontology matters in the solution of the complex problems facing humanity. Nicolescu (2011) differentiated between real and reality. Real is what is (a fact, an actual thing, something not imagined or simulated, not illusionary). Real is Latin res, ‘thing.’ The lay definition of reality is the state of things as they actually exist; a thing that can be actually experienced or seen. Nicolescu explained that reality is not merely a social construction, a consensus of a collective or an inter-subjective agreement. The latter are examples of reality as pragmatic. Reality can also be ontological, meaning it is concerned with the nature of being, of existence (see McGregor and Murnane (2010) for an overview of what constitutes ontology for each of scientific, interpretive and critical methodologies). TD ontology is called multiple Levels of Reality and the Hidden Third (Nicolescu capitalizes these terms, a convention used in this paper). Category theory enabled Nicolescu (2006b, 2010) to conceive Reality as comprising many different levels. He proposed that it is essential to seek multiple perspectives on any human problem (or set of human problems) because the intent is to integrate many levels of truth while generating new knowledge. Succinctly, TD ontology respects the complex and dynamic relationships among at least 10 different realities organized along three Levels of Reality: (a) the internal world of humans, where consciousness flows – the TD-Subject (comprising political, social, historical, and individual realities); (b) the external world of humans where information flows – the TD-Object (comprising environmental, economic, and cosmic/planetary realities); and (c) the Hidden Third. Peoples’ experiences, interpretations, descriptions, representations, images, and formulas meet on this third level. Three realities exist in this intuitive zone of non-resistance, this mediated interface: culture and art, religions, and spiritualities. Together, the three Levels of Reality form TD ontology (see Figure 1). Each of the 10 realities along the three levels is characterized by its incompleteness; yet, together, in unity, these realities generate new, infinite knowledge (Nicolescu, 2006b). 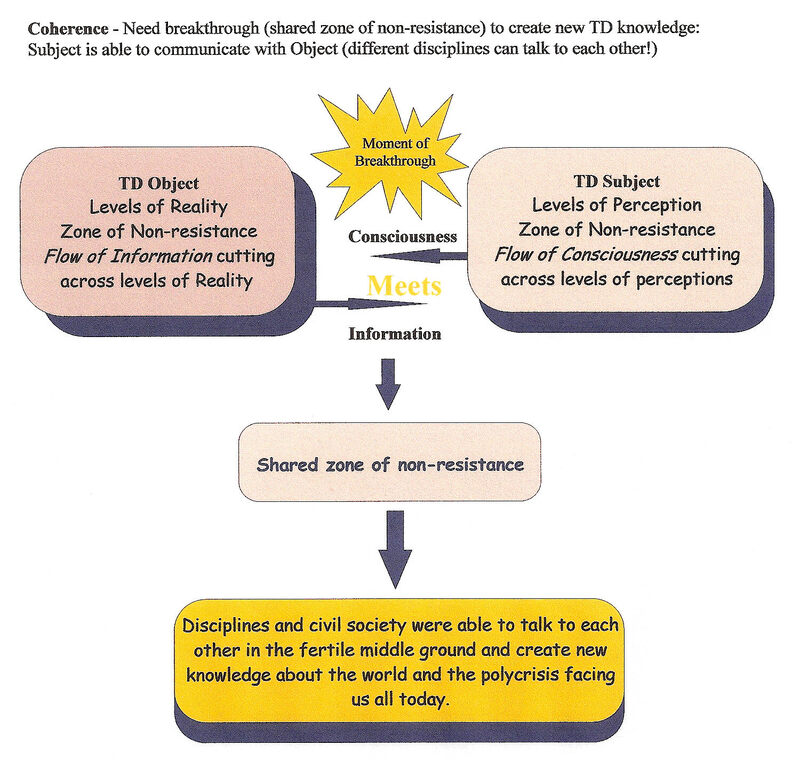 TD ontology deals with the mediated flow of inner consciousness (perceptions) and technical information from different realities leading to a meeting of the minds in a Zone of Non- Resistance (the Hidden Third, see below). In this space, people shed their resistance to truth informed by other realities and join these realities to generate complex TD knowledge. McGregor (2011a) prepared Figure 1 to illustrate this idea. 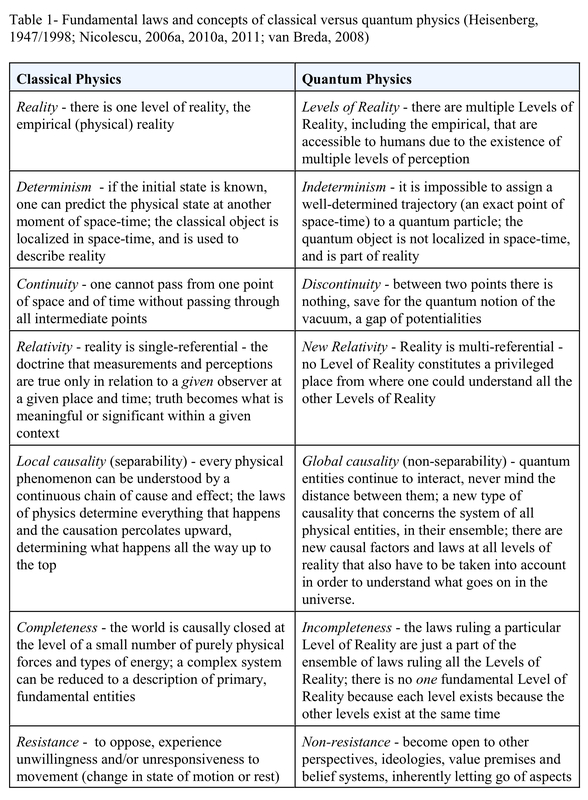 Nicolescu (2008) used Figure 2 to convey his deeper understanding of multiple Levels of Reality. He maintained that the Hidden Third refers to both (a) the region between the TD- Subject and the TD-Object (per Figure 1) and (b) the region between the 10 Levels of Reality (see Figure 2). The concept of the Hidden Third links all Levels of Reality. It is through this region between the levels that information from the Hidden Third is injected into real life (personal communication, Basarab Nicolescu, January 10, 2011). Figure 3 is embedded within Figure 2 as a way to represent this idea (Nicolescu (2007). One point of the triangle is situated at one Reality (NR1, e.g., economic) and the other two points are located in another Reality (NR2, e.g., environment). 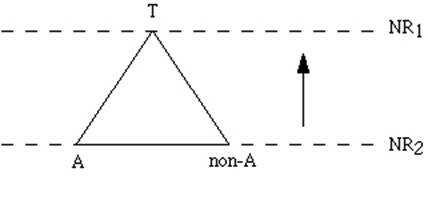 A and non-A represent classical linear logic, based on three fundamental axioms: (a) the axiom of identity: A is A; (b) the axiom of non contradiction: A is not non-A; and, (c) the axiom of the excluded middle, meaning there is no third term T, which is simultaneously A and non-A. This is a classic example of dualism (Max- Neef, 2005). Dualism holds that the mind (consciousness) and the body (object) are separate. Rejecting this claim, Nicolescu (2011) proposed a change to the third classical linear logic axiom, submitting that a third term T does exist, which is simultaneously A and non-A. Without the Hidden Third, the third term T, problem solvers would not be able to integrate perspectives from different realities (e.g., economics with environmental), let alone integrate Subject (consciousness and perceptions) with Object (information). 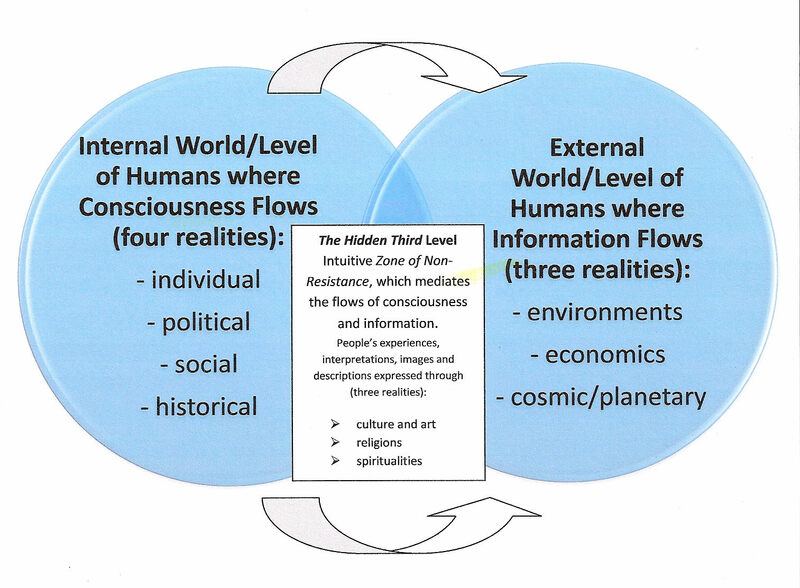 Nicolescu’s (2011) theoretical premise is that the Hidden Third mediates the flow of information with the simultaneous flow of consciousness such that divergent minds can connect and share information and perspectives so as to solve complex, emergent problems. The emergence of a temporary new T state (see Figure 3) represents the emergence of new insights and perceptions, made possible because of the temporary reconciliation of any contradictions or antagonism between A and non-A (Cole, 2006). The arrow pointing upward in Figure 3 denotes temporary unification of contradictions and antagonism amongst various points of view (Levels of Reality) thereby increasing the generation of TD information about a complex problem (personal communication, Basarab Nicolescu, January 14, 2011). To better appreciate the deep nuances of TD ontology, relative to classical physics, three of its features need to be demystified: discontinuity, resistance and incompleteness (see Table 1). Before explaining these ideas, the idea of the quantum vacuum must be addressed. Newtonian physics assumes that the space between entities is dead, empty, void, stagnant and static, like the spaces between the balls on a billiard table (Engle, 2008; McGregor, 2004). Quantum physics assumes, instead, that the space between realities is not empty; rather, it is full of all potentialities (Nicolescu, 1999). Although called a vacuum, it is not an empty void, absent of matter, as the lay notion of vacuum implies; instead, quantum physics defines vacuum as the state with the lowest possible energy. The vacuum contains zero-point energy (called the ground state), which, although low, is higher than zero. The quantum vacuum contains fleeting electromagnetic waves and particles that pop into and out of existence (invisible matter and energy); hence, it cannot be empty, but is full of potentialities (Dittrich & Gies, 2000; Nicolescu, 2010b). To be logical means something has orderly continuity. Illogical means it lacks orderly continuity. In contrast, the Hidden Third is alogical, meaning it is not based upon logic or reasoned argument. Something that is alogical is opposed to, or resists, logic, valuing discontinuity instead (personal communication, Basarab Nicolescu, January 14, 2011). While classical physics assumes continuity between boundaries, quantum physics assumes discontinuity. Nicolescu (2010b) posited that “the unconscious barrier to a true dialogue [about TD] comes from the inability of certain transdisciplinary researchers to think about discontinuity [, the crux of TD ontology]” (p.23). 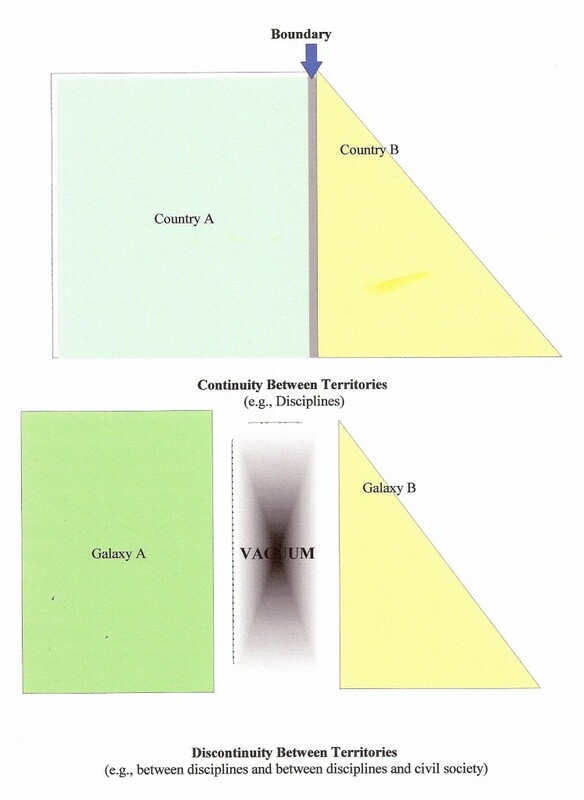 Classical physics assumes that if territories get close enough, their boundaries can intersect (cut across) each other and be crossed, if permeable enough. In this process, the boundaries between the territories continue to exist, with continuity meaning uninterrupted connections, union or durations of time. As well, classical physics assumes that continuity means things cannot move from one point of space and of time without passing through all intermediary points; nothing can be skipped over – it has to be continuous, with no interruptions. Not surprisingly, the classical idea of continuity is intimately linked to a continuous chain of cause and effect (Nicolescu, 2006a), evidenced by the popular notion of not breaking the chain of evidence. Quantum physics, on the other hand, assumes that moving from one territory to another does not require the boundaries to actually touch; instead, people move across a vacuum to get from one point to another. There is discontinuity (a gap) between the territories, with discontinuity meaning “between two points there is nothing, no objects, no atoms, no molecules, no particles, just nothing” (Nicolescu, 2006a, p.3). TD knowledge generation is assumed to occur in this vacuum due to the mediated role of the Hidden Third (see Figure 4). Nicolescu referred to discontinuity as a place void of logical reason, a place that reflects “the dark light of the unknown,” an unknown that paradoxically cooperates with the known by injecting information into the Kosmos (personal communication, Basarab Nicolescu, January 10, 2011). Most significantly, continuity and discontinuity must not be considered binary opposites; instead, people must be prepared to consider both the continuities and the ruptures between realities rather than defending one or the other. The former meets the challenge of “thinking the complex [rather than] driving the Cartesian wedge between them” (van Breda, 2008, p. 5). In lay terms, there must be a place for disciplinary and interdisciplinary scholarship (based on continuity) in concert with transdisciplinarity linkages between the academy and civil society (discontinuity), else we cannot hope to solve the problems facing humanity. Cole (2006) asserted that while quantum physics assumes there is a vacuum between things (in this case, between the different Levels of Reality), “humans are not aware of the existence of regions of discontinuity” (p.10). Because of this lack of awareness, they often experience resistance to ideas coming from other disciplines and perspectives. Resistance is a second key construct of TD ontology. To resist means to oppose and/or to experience unwillingness or unresponsiveness to changes in states of motion or rest. In order to gain new insights into complex problems, people need new insights and perceptions, which can only be perceived from new vantage points, which in turn can only appear if people move their points of reference back and forth between different realities (e.g., between academics and social actors) (Cole). Nicolescu introduced the construct of the Hidden Third as a way to represent coping with the resistance inherent in shifting perspectives. As noted, he conceived 10 realities and, inspired by category theory, organized them along three levels (see Figures 1 and 2). Nicolescu (2011) acknowledged that humans have always accepted there are at least two realms of Reality – one visible and the other invisible. The Hidden Third is the invisible realm in TD ontology. To illustrate the resistance inherent in perspective shifting (moving from one Reality to another, connecting with unfamiliar or antagonist modes of thinking and view points), Nicolescu creatively employed the concept of theosis (becoming one with God) proposed by a monk called John of the Ladder. 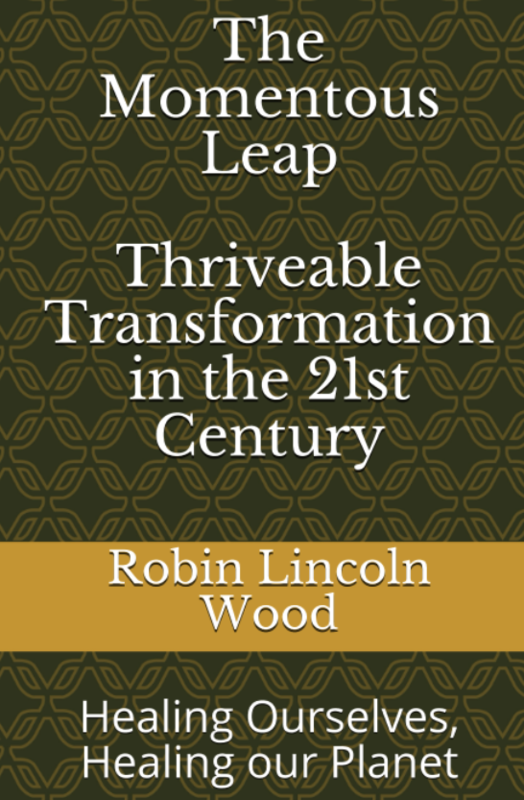 “The human being climbs the steps [of the ladder], which denote the effort of the human being to evolve [to a] spiritual point of view through the resistance to his or her habits and thoughts, but the angels, these messengers of God, help him or her to jump through the intervals of non-resistance [the vacuum] between the steps of the ladder” (p.4). If people can overcome their resistance to differences or contradictions, it frees them to cross through the vacuum to another point of view. The Hidden Third is a construct representing people moving through this zone of non-resistance, a place where people become open to other perspectives, ideologies, value premises and belief systems, inherently letting go of aspects of how they currently know the world. Cole (2006) explained that being in the transition zone “involves a breakdown in the laws and logic that hold in the [person’s] perception of Reality” (p.13). It is believed that this zone resists our current way of knowing and of seeing the world, thereby acting as a catalyst for shifts in, and the emergence of new, perspectives. In effect, it is the lubricant for the generation of TD knowledge. McGregor (2009) prepared Figure 5 to illustrate the fundamental thinking behind this TD dynamic. In particular, Nicolescu (2010a) linked the sacred with the Hidden Third, in addition to culture and art (see Figure 2). To be sacred means that something (a) is entitled to reverence and/or (b) is related to religion and spirituality. Culture pertains to art, drama, dance, music, theatre, song, poetry, literature and other aesthetics employed by a people to express their inner selves, their connection with others, and/or the many manifestations of humans’ intellectual achievements. Nicolescu deeply believes that coping with discontinuity requires the Hidden Third, else the flow of consciousness from the internal TD-Subject cannot ever connect with the flow of information generated by the external TD-Object. Put simply, the natural sciences must be able to communicate with the social and human sciences, and with the deep essence of what it means to be human, if we are to solve the complex problems of the world. Holding the Hidden Third, the mediating mechanism that links subject with object, as a revered aspect of human problem solving, is a key contribution of TD ontology. A third concept related to TD ontology is incompleteness. Fuchs (2002) explained that no matter how much is known about a quantum system, even when there is maximal information, there will always be questions that can be asked; there will be incompleteness (not total). TD ontology presumes that every level of TD Reality is characterized by incompleteness because the laws governing one level are just a part of the totality of laws governing all levels (Nicolescu, 2010a, 2011). Concomitantly, there is no one fundamental Level of Reality. Classical physics understands the term more fundamental to mean that a complex phenomenon can be reduced to the simpler, core, primary entity, to its most fundamental level (Nicolescu, 2008). In the spirit of TD methodology, Nicolescu referenced a new Relativity Principle, “No Level of Reality constitutes a privileged place from where one could understand all the other Levels of Reality. A Level of Reality is what it is because all the other levels simultaneously exist” (2006a, p. 14). A related idea is that “two levels of Reality are different if, while passing from one level to another, there is a break in the laws and a break in the fundamental concepts (Nicolescu, 2006a, p. 13). “One level cannot be understood in the terms of the laws and concepts of another level. …Each level must be approached, interpreted, and explained in terms of its own [fundamental] concepts and logic” (van Breda, 2008, p.6). This must be done while appreciating that a Level of Reality is what it is because all of the other levels simultaneously exist. In effect, in order to understand the complex structure of TD Reality, people have to accept that Levels of Reality are not only separated, they are also connected (van Breda). Transdisciplinarity is deeply concerned with the dynamics that are created by the simultaneous action of several Levels of Reality (Nicolescu, 1999). TD assumes that Reality cannot be reduced to substance; instead, Reality is the complexus (an aggregate) of substance- energy-space-time-information (Heisenberg, 1942/1998; Nicolescu, 2008). Because Reality is in constant fluctuation (among these aggregate parts), it is impossible to arrive at an exact and complete portrait of Reality (Nicolescu, 2008). To that end, Nicolescu (2011) posited that TD Reality is plastic, meaning it is malleable and pliable. He referred to “the overall movement of Reality” and suggested that people’s freedom consists of entering into or perturbing the movement of Reality. “Reality depends on us” because “we are part of the movement of Reality” (p. 15). Although the TD ontological position is in stark contrast to classical physics’ notion of Reality, it does not abolish the logic of classical physics; it only constrains its sphere of validity (Nicolescu, 2007). Indeed, the logic of classical physics is quite germane to simple problems (called tame problems), but is harmful when applied to the solution of complex, wicked problems (e.g., climate change, global justice, sustainability, poverty) (see Batie (2008) for a discussion of tame and wicked problems). The polycrises facing humanity cannot be adequately dealt with using disciplinary or even interdisciplinary knowledge that ignores the voices of those living the problems (indigenous, local, community knowledge) – their reality (van Breda, 2008). 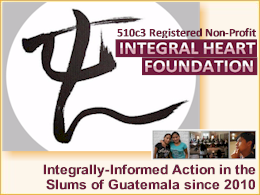 A polycrisis is a term Morin (1999) used to describe a situation where there is no one, single big problem – only a series of overlapping, interconnected problems. In these instances, research and political and social action predicated on classical physics, especially the empirical, positivistic methodology, incorrectly assumes that disciplinary expertise will suffice. On the other hand, research and political and social action predicated on quantum physics assumes that a combination of disciplinary and civil society knowledge is required. 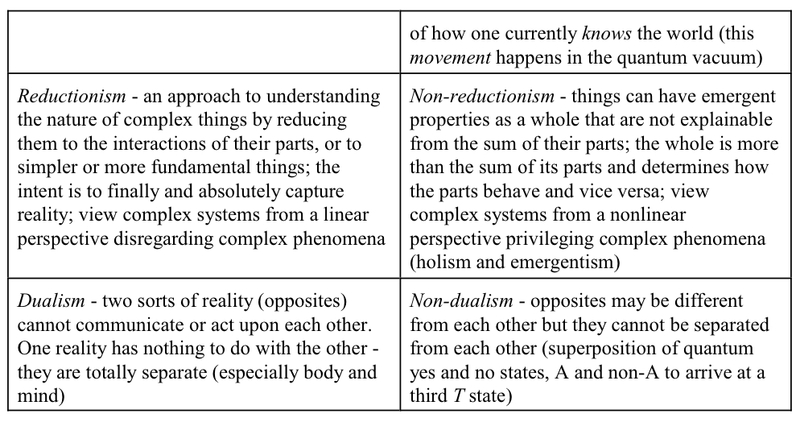 In particular, TD ontology (see Figure 1 and 2) enables people to appreciate the necessity of seeking multiple perspectives on any set of human problems, and that this process is fraught with chaos, resistance, contradictions, antagonism, paradigmatic reconciliation and the necessity of integrating many levels of truth while generating new knowledge (Nicolescu, 2007). 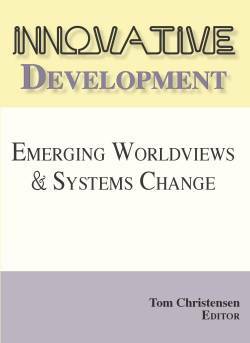 Overcoming this state requires people to be so bold as to create new approaches that move beyond the classical notion of science (Druguo, 2010) towards approaches focused on the complex, emergent, dynamic interactions amongst academics and the rest of the world. Druguo suggested losing the word science altogether, opting instead for “research, information, cognition and knowledge” (p. 57). In this spirit, TD methodology can be described as the generation of complex, emergent TD knowledge through the process of research and problem solving (via the Logic of the Included Middle) predicated on flows of information, consciousness and cognition (i.e., perception, learning and reasoning). Its core axiom, TD ontology (multiple Levels of Reality and the Hidden Third), offers the world a rich orientation for addressing the wicked polycrises facing humanity and moves us far beyond the limiting assumptions of classical physics. Dittrich, E., & Gies, H. (2000). Probing the quantum vacuum. Berlin, Germany: Springer. Druguo, L. (2010). From modern disciplinary science to postmodern transdisciplinary knowledge. Economy, Transdisciplinarity, Cognition, 8(2), 53-69. Engle, E. (2008). Ontology, epistemology, axiology: Bases for a comprehensive theory of law. Appalachian Journal of Law, 8(1), 103-122. Heisenberg, W. (1942/1998). Philosophy – Manuscript of 1942 (C. Chevalley, Trans). Paris, France: Editions du Seuil. Fuchs, C. (2002). Quantum mechanics as quantum information (and only a little more). In A. Khrennikov (Ed. ), Quantum theory: Reconsideration of foundations. Vaxjo, Sweden: Vaxjo University Press. McGregor, S. L. T., & Murnane, J. A. (2010). Paradigm, methodology and method: Intellectual integrity in consumer scholarship. International Journal of Consumer Studies, 34(4), 419- 427. Morin, E. (1999). Homeland earth. London, England: Hampton Press. Nicolescu, B. (2006a). Heisenberg and the Levels of Reality. European Journal of Science and Theology, 2(1), 9-19. Nicolescu, B. (2010a). Disciplinary boundaries – What are they and how they can be transgressed? Paper prepared for the International Symposium on Research Across Boundaries. Luxembourg: University of Luxembourg. Retrieved from http://dica- lab.org/rab/files/2010/06/Paper-Nicolescu-Special-Issue.pdf (password protected). Nicolescu, B. (2010b). Methodology of transdisciplinarity. Transdisciplinary Journal of Engineering and Science, 1(1), 19-38. Nicolescu, B. (2011). Transdisciplinarity: The Hidden Third, between the subject and the object. In I. Chirilã and P. Bud (Eds. ), atiinþã, Spiritualitate, Societate [Science, Spirituality, Society], (pp. 11-34). Eikon, Cluj-Napoca, Romania. Ponterotto, J. G. (2005). Qualitative research in counselling psychology. Journal of Counseling Psychology, 55(2), 126-136. 1 In addition to perceiving TD as a methodology, there is a parallel TD initiative predicated on “the refusal of formulating any methodology and by its exclusive concentration on joint problem-solving of problems pertaining to the science-technology-society triad. 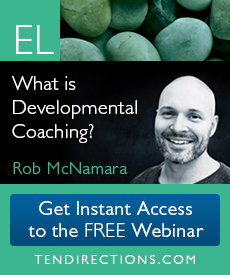 This approach is represented by figures like Michael Gibbons and Helga Notwotny. The point of view of this transdisciplinarity current was largely expressed at the Zurich Congress, held in the year 2000″ (Nicolescu, 2010b, p. 22).